Inducted 2004. High School All-American in Soccer in 1988. Class of 1989. Drew wasn’t one of the biggest players to wear the blue and gold, but he used his blinding quickness and dazzling ball skills to become one of the best soccer players in school history. Drew, a 1989 graduate, was a four-year letterwinner in soccer. He scored 35 career goals, ranking eighth on the school’s all-time list, and he assisted on 21 goals, ranking 12th all-time. He was a captain as a junior and as a senior, and he was the team’s most valuable offensive player, most valuable player, all-sectional, all-state and all-regional as a junior and as a senior. He was also named to the high school All-America team as a senior in 1988. Drew attended Quincy College briefly before transferring to Rockhurst University, where he played for three seasons. 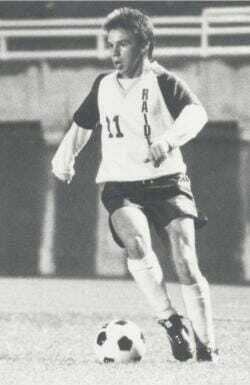 In 1991, he scored 15 goals as Rockhurst went 23-2 and eventually placed fifth in the NAIA National Tournament. He finished his career at Rockhurst with 21 career goals. Drew now lives in Prairie Village, Kan., and works for a telecommunications and e-learning company. I’m honored to be inducted into the QND Hall of Fame, and I’d like to thank all of my teammates, coaches and the Hall of Fame Committee. Soccer is a team sport, and I was fortunate to learn from and play with great players like Mark Thomas, Kevin Koetters, John Prow, Tony Adolfs, Mark Kolodziej, the Mackenzie brothers, the Sohn brothers, the Hilbing brothers, the Deters brothers, Bill Siebers, Dan Doane, Chris Schuering and Kevin Meyer — just to name a few. I’m also grateful to the late Frank Longo, who did a lot for the game nationally and locally. We were lucky to have him as our athletic director and head coach. Lastly, I’d like to thank my family, especially my brothers Kevin and Matt for all the time they spent practicing and playing the game with me.